UofL is retrofitting various rooms around campus to serve as models for sustainable design principles. UofL's model Green Dorm Room opened in Louisville Hall (Room 605) in Fall 2009 but was first developed as a challenge to 10 students in Jamie Horwitz's Spring 2009 Sustainable Architecture course. 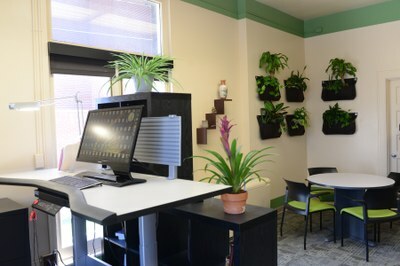 At the request of Russ Barnett, director of UofL's Kentucky Institute for the Environment and Sustainable Development, these students developed their own designs for the room as a model of sustainable living on campus. Turning the students' conceptual design into an actual dorm room was made possible with a $5,000 grant from Arts and Sciences Dean Blaine Hudson. The floors are made of bamboo, a faster-growing and more sustainable alternative than wood, synthetic flooring or carpet. One wall is covered in clay, a natural building material which has insulating properties, improves air quality by catching dust, and is easier to repair and maintain. Large windows let in plenty of natural light, eliminating the need to use electric lights during the day. A ceiling fan helps regulate temperatures more efficiently. A low-flow showerhead and toilet, as well as an aerator on the faucet, has cut water use by about 50 percent. With high ceilings, large windows and the several distinctive "green" characteristics, the room is more like a modern, innovative, energy efficient living space than a typical dorm. 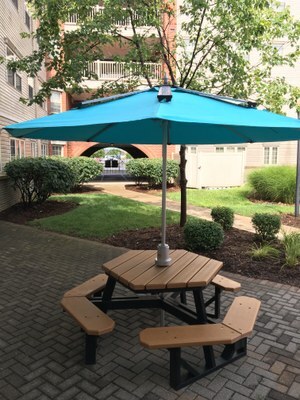 Residents of the model green dorm room participate actively in the Housing and university-wide sustainability committees, act as sustainability leaders within the community, and welcome tours to demonstrate sustainable living principles. Read more about the student design process. Read more about the experience of living in the green dorm room: UofL Green Scene: Living Green and Loving It. Natural day-lighting from a large window, eliminating the need to use electric lights during the day. A ceiling fan to help regulate temperatures more efficiently. Modular carpet tiles which allow for easy replacement of only the worn portions, without having to dispose of the entire carpet. High-efficiency florescent lights with motion sensors for automatic shut off when the room is unoccupied. Durable ceiling tiles made of recycled plastic which will not sag or stain like conventional ceiling tiles. The Sustainability Council hopes to see this program expand to include more Model Green Spaces around campus - from labs to classrooms to clinics! UofL has participated in the Campus Conservation Nationals (CCN), or an internal UofL Ecolympics each spring since 2012. During this residence hall energy-reduction competition, each UofL hall tracks their electricity usage, competing against each other to maximize conservation over a three-week period. In 2014, a new prize was added: The winning UofL hall would undergo a green renovation the following summer, with specific projects selected by the residents. During the 2014 competition from January 27th to March 3rd, UofL residents were able to reduce electricity usage by 2.9% overall, but residents of Threlkeld Hall posted an 8.9% reduction to become the champions. The flooring in the lobby was changed from well-worn, stained carpet to a luxury vinyl tile. Not only is the tile better looking, but it is also a longer-wearing product that requires only water to clean – no chemicals or other harsh products. All of the old, inefficient washing machines were replaced with newer, more efficient models. Threlkeld Hall won the competition again in 2015! From February 9th to March 1st, 2015, residents reduced energy consumption by 2.3% in spite of extreme cold and snow which cancelled classes several days and kept residents stuck inside. As grand champions, the residents of Threlkeld received a special in-house dinner catered by Mark's Feed Store on April 16th. During the meal, residents brainstormed possible projects to be part of their Green Renovation award. Thanks to the resident's energy-conscious actions, over the summer of 2015, the Threlkeld lobby got a brand new water bottle filling station and bikeshare system. Solar-powered mobile device charging as fast as a wall outlet, day or night. Three weather-proofed USB ports charge up to three mobile devices simultaneously. Durable, marine-grade umbrella protects users from harmful UV rays. Intelligent sensing acknowledges when mobile device is fully charged. LED display indicates how much solar energy is currently stored for charging needs.